When discussing Rocky Mountain National Park there is no debate as to which peak is the most iconic peak in Rocky Mountain National Park. Without question Longs Peak, the 14,259 ft peak that towers over all of Rocky is the centerpiece and icon of Rocky Mountain National Park. It's the parks only peak that rises above 14,000 ft and furthermore thousands of visitors to RMNP attempt to make the difficult ascent to the summit each summer season. Longs Peak is something to behold from any angle and viewing distance. From points south along the Front Range it shares its vantage with Mount Meeker but is both beautiful and imposing. From the east, Longs Peak and Mount Meeker resemble two ears or rabbit ears as they were known. From Trail Ridge Road its block summit looks like the control tower for a large navy ship. Personally, my favorite view of Longs Peak is from just below its summit, at the base of its imposing northeast face 'The Diamond' as photographed from the rocky shores of Chasm Lake. 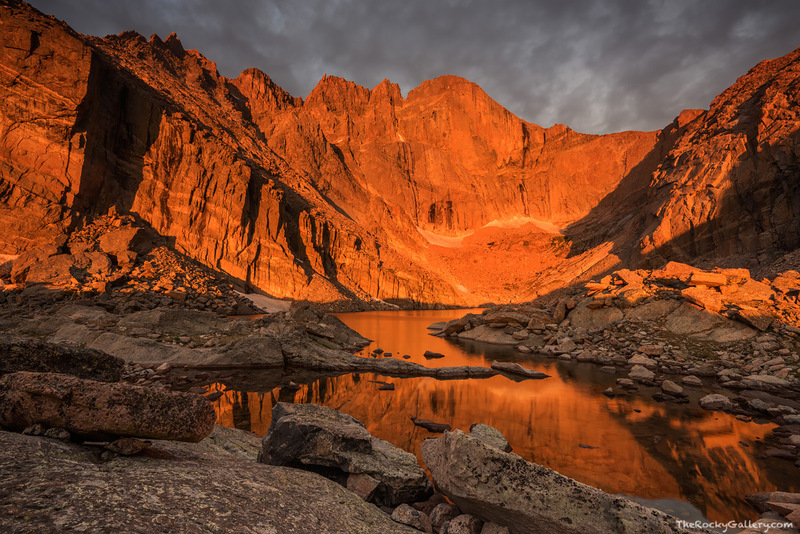 The combination of the viewpoing of Longs Peak from Chasm Lake combined with the awesome 4.1 mile predawn hike make it one of the most memorable locations to visit in Rocky. I have made many trips to Chasm Lake for sunrise. It can be a difficult location to photograph as snow,ice,lighting and wind can all be a factor in making the trip safely. This morning the conditions held long enough for me to capture and image I had be invisioning for as long as I have been photographing Chasm Lake. A light rain was falling when I made my ascent to Chasm Lake this August morning. There was a clear break in the cloud cover to the east so that despite the rain, chances looked good that the sun would illuminate Longs Peak at dawn. After waiting along the shores of Chasm Lake for the sun to rise, all the while, chilled with sweat from the hike up as well as covered by the mist from the rain, I was greeted with one of the most beautiful and dramatic sunrises I have witnessed in all of Rocky Mountain National Park. Longs Peak and The Diamond stood out like a glowing beacon as the dark storm clouds surrounded the mountain. The light only last a short time but it was more than enough time to make for an indelible morning at Chasm I will never forget. Photo © copyright by Thomas Mangan.